My, my, there are so many many audio amplifiers to choose from, in fact far too many and the task can seem daunting and just too hard. How to meaningfully differentiate? From my vantage point in New Zealand, I have made a list of audiophile candidates, and had been studying what is being said among enthusiasts about the REDGUM Audio design ethos and the performance of this amplifier. I wanted to know two things. Did I buy the story, and would I buy the amplifier? The producer's familiar mantra is “it's all about the music” and “less is more”. For them, design is not driven by specifications, but by asking what does it take to deliver music exactly as you would hear it live? I gather from the supplied reviewer information pack that founder Ian Robinson's design values emphasise simplicity and neutrality for best transient capabilities and sound transparency within the budget. This has led to minimalist functions to reduce signal processing time, to achieve fast and clean performance, close to “a straight wire with gain”. This resonates with me as I know from my experience with my reference system - now the locally-produced Sachem Pure preamplifier and V2 monoblock power amplifiers - that transient performance and clean signal carrying are paramount for exhilarating presence and heft such that you feel the music as you hear it. The RGi35ENR is one model of the Black Series from REDGUM Audio, located between Ferntree Gully and Cockatoo (near Melbourne) in Australia. This is a MOSFET high current, high Damping Factor design that will drive very low speaker impedances to neutrally reproduce real music. It's a dual mono build with a special test and safety start-up process, and a unique remote control. The output is rated at 50 Watts RMS each channel, and measures 65W RMS into 8 Ohms with 140W transient (short-term RMS), 80W RMS into 4 Ohms with 280W transient, and 95W into 2 Ohms with 560W transient. This amplifier has some neat features that enhance the user experience and visual appeal. Out of the box, it's a cold heavy slab of black metal, looking a bit mysterious. At more than 16Kg, you can't miss the massive heatsink in the shape of a sinewave waveform on which it stands. It has colour-coded source input connections, so labels never go out of date as you just need to learn which colour is associated with each source and the corresponding coloured LED illuminates on the front panel. The remote control is intentionally only a code carrier and can be used to ‘teach' a universal remote. Oh, and then there's that seven year warranty. Now, what about the music? As I connected up and started the automatic test sequence by pushing the power-up button on the remote, I just knew that this was going to be fun connecting to my Audio Pro Avanto 100 DC floor-standing speakers. The inclusion in the comprehensive reviewer's information pack of a copy of Chesky Records' Ultimate Demonstration Disc and Guide to Critical Listening strongly signalled what the REDGUM Audio folks thought I should pay attention to in my audition. This disc covers a range of sonic quality criteria explained and demonstrated with Chesky recordings of Rebecca Pidgeon, Sara K., Livingston Taylor, Ana Caram, Monty Alexander, among others. My appetite for crisp punchy dynamics and big soundstage whetted, I reached for my McIntosh, Focal-JMLabs, and Usher Audio demonstration discs, featuring those impressive Ron Tutt and Jim Keltner drum improvisations and a range of classical, jazz, and other high quality recordings. I had also recently acquired an HDCD sampler from Reference Recordings, and a copy of the Alpine Speed of Sound demo CD, as well as a PCM recording demo LP from Nippon Columbia Japan and Enoch Light's Project 3 stereo test record LP. Oh, and don't worry, I also played lots of regular great music too! As always, the quality of the recording is of paramount significance when auditioning home audio equipment in your own listening setting. The sound quality criteria in mind as I listened were thus musical definition of instruments, natural presence and musical balance, evident in high resolution, depth, atmosphere, midrange purity, naturalness, transparency, presence, visceral impact, rhythm and pace, focus, (holographic imaging), transients, bass resonance, and dynamics. Phew! That's quite some list of observations and much demanding of any audio equipment. This should all come together to amount to discernable fine details and textures, subtle shadings of dynamics, the acoustics of the recording site (often a large space and recorded live in the case of Chesky records). There was no doubt in my mind that the amplifier acquitted itself most impressively. I sensed this when I felt the big wide grin on my face as I listened to the demonstration pieces. I was drawn to recordings that I know to be punchy, crisp, and lifelike, including Joe Jackson's Big World, the Cowboy Junkies' Trinity Session, and a couple of Charly Antolini's truly exhilarating albums. Listening easily became an eagerly awaited daily pleasure, with that big wide grin forming as more and more of my favourite music passed through the amplifier on its way to my very capable speakers and then on to my happy ears. The reproduced music was dynamic in a way that was obviously not just louder, giving a level of realism with a ‘zing'. Quite literally, a stunning sonic experience. That dual mono configuration presents a very ‘true' image, so that when I closed my eyes, there was no sense of separated loudspeaker sources. The various tests given by the Chesky Records recordings showed clearly that the REDGUM was doing what an amplifier is supposed to do, and highly convincingly. I was delighted time after time by the ease with which I was able to slip into listening to great music without concerning myself with the equipment. In the many years of my hifi hobby journey (beginning in the early 1970s), many products have come and gone that disappointed or had unjustified prices. This one is quite different. Throughout my listening time with the REDGUM I was repeatedly surprised when I reminded myself that this is a AU$2000 amplifier. It is evident that investment in keeping it simple pays off in spades with this one. When I first saw and felt the hefty black box, I was minded of an engineering machine, and after reading the preliminary caution about the start-up test routine it performs each time of switch-on, I wondered about finesse and sophistication. Yet, here it is, a highly sophisticated performer with very substantive capability in rendering music the way it should be heard. Just like its arboreal namesake, the REDGUM Black Series is a real grower, bigtime. When I checked back, I was surprised that REDGUM Audio had not featured in TNT-Audio reviews in the more than 20 years of their evolving and expanding component range. I had sensed there was something of a buzz among audiophiles, and I wanted to understand it for myself. And hear why I most certainly did. 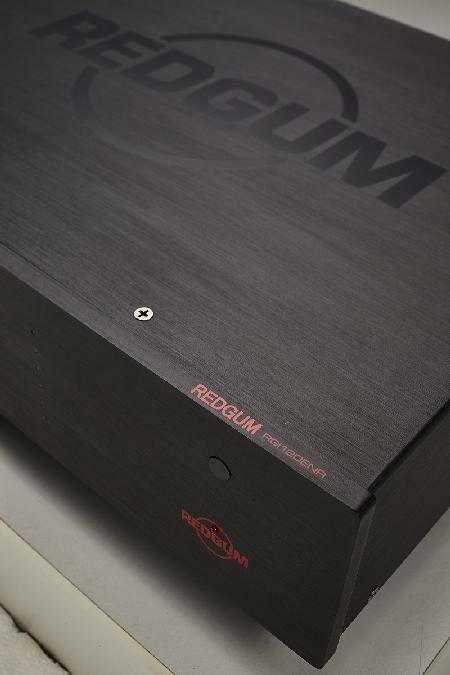 From the first play, I was relishing the REDGUM experience, and that feeling of potency and musicality, and this is certainly not just another amplifier! So it turns out that the REDGUM Audio Black Series RGi35ENR is far from just another amplifier. Highly recommended for performance and value for money, as well as its notable design features. If I were in the market for a $2000 integrated amplifier then surely this would have to be top of my list, and I wonder which other product could seriously contend for best performance at the price. Thanks to Lindy Gerber at REDGUM Audio for her delightfully helpful and friendly co-operation in facilitating this audition. This audition was great fun, and it reminded me why I love music, audiophilia, and reviewing.